Who is really buying blockchain, who are the decision makers in businesses, enterprises and organizations? Charlotte Dunlap, Technology Analyst at leading data and analytics company GlobalData, believes platform services providers are poised to dominate in the emerging blockchain industry, even as large enterprises and organizations continue to explore the practical applications of the decentralized ledger to enhance existing systems, or serve as a foundation for new ones. Dunlap, who has authored several notes on blockchain for enterprise, called out Applications Lifecycle Management (ALM) as a key trend, along with open standards being introduced and advanced by organizations like Linux Foundation’s Hyperledger project. Dunlap has followed and written about disruptive enterprise technologies through her career as a top global analyst and was drawn into covering blockchain as the next movement in improving digital systems, by providing better tools and more automation, with more efficient authentication contributing to securing data integrity, critical to multi-cloud, multi-app, multi-counterparty use cases. Dunlap, like other industry observers, sees supply chains as one of the most obvious opportunities for blockchain applications. 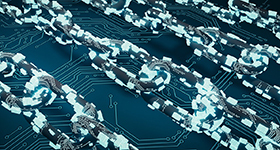 Dunlap sees the buying decisions by enterprises for blockchain solutions coming from business unit owners, CIOs and more visionary IT leaders who are the ones ultimately responsible for systems integration and management.